Posted on April 22, 2015 . As soon as we took the administration of the ISLSSL, we proposed to the International Association of Labour Law Journals, in the person of its president Prof. Steven Willborn, the idea to develop an annual volume comprising significant articles published in journals of labour law. 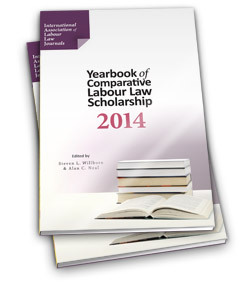 The International Society for Labour and Social Security Law (ISL&SSL) has asked [us] to consider publishing an annual volume of leading articles on labour and employment law. This document is an initial proposal designed only to structure a productive discussion of the topic. 1. Initially, the Volume would be published only on-line. It would be published on the websites of the International Association of Labour Law Journals (IALLJ) and the international site of the ISL&SSL. 2. Initially, the articles would be published in their original language only (no translations). 3. One article would be chose for inclusion in the volume by the editors of each participating journal. 4. Only members of the IALLJ would be eligible to participate. 5. Members of the IALLJ would not be required to participate. 6. Individual journals would retain all copyright rights in the articles; they would transfer to the IALLJ only the one-time right to republish in the Volume. 7. The Volume would clearly indicate the journal in which each article was originally published and it would provide subscription and contact information for that journal. 2. The Volume would be an advertisement for members of the IALLJ. It would permit the journals to feature the high quality of articles in their journals and, perhaps in so doing, to increase their subscriptions. 1. Copyright issues would need to be sorted out. 2. Duties for composing the Volume would have to be assigned and assumed. We believed that such a publication would constitute a significant contribution to legal knowledge in our specific area and to reach out the public of specialised reviews. It is not an easy task. Steven Willborn undertook a painstaking process of consultations to each and every one of the magazines that integrate IALLJ. After obtaining a majority consensus, the first annual volume has started. It is coordinated by Steven Willborn and Alan Neal, who has expressed a willingness to cooperate in this project. It is clear, in any case, that the possible publication of this volume is subject to its content and coherence, in addition to the consensus given by the magazines involved. It is only then that the volume might be published. Our thanks go to Alan Neal and Steven Willborn for the enthusiasm and dedication that they are putting in this project. Posted on February 11, 2014 . The organization of this seminar, which will take place between 4 and 14 May 2014 is continuing. ISLSSL fellowships have been given through our national societies. The duration and activities of the seminar have been extended to 80 hours of class, in order to produce a greater impact on the training of young legal scholars who will take part in it. This time, the theme is “The Employment Relationship”. We are pleased to note that the first two classes of the seminar will be delivered by Enrique Marin Quijada, who, as an ILO official, was responsible for the preparation of the reports to the Conference that in 2006 adopted Recommendation No. 198 on the employment relationship. Other faculty members are: Rafael Albuquerque, Jose Luis Ugarte Cataldo, Jorge Rosenbaum and Oscar Hernandez. With a view to opening a discussion among our members within the newly established website of the ISLSSL, we have asked to Professor Tiziano Treu – one of the greatest contemporary Italian jurists – to prepare a position paper to start a debate on how labour law and social protection systems should “surf” in the present and future contexts. You will find attached Professor Treu’s paper that you can also find in the Open Forum section of our website. We kindly ask you to forward it to the members of your respective national associations. The text in its original English version is in the three versions of the website with the purpose of giving direct access to everyone without delay. At the same time, we are translating it into French and Spanish, so we can post it in the respective web sites as soon as translation is available. The debate is open. We look forward to your contributions and reciprocal exchanges, and we ask you to send your contributions to the following address (casale@ilo.org and adriangoldin@derecho.uba.ar) for incorporation in their original language in our website. The hierarchy and depth of the exchange, suggested by Professor Treu’s rigorous document, depends on each and every one of us. Depending on the results, we can further think of the possibility of organizing a meeting (seminar or conference) around this. Posted on June 13, 2013 . When we started our functions, we announced that one of our priorities would be the launching of a new website that would render more dynamic the work of the Society. Today, thanks to the generous support of Jeffrey Sack and colleagues at Lancaster House in Canada, and of Steven Willborn (USA), we are delighted to announce the launch (www.islssl.org). Posted on April 19, 2013 . Two months after the beginning of our administration, we would like to inform you about what we are doing at this initial stage of our mandate and how we would like to proceed in our future work. First of all, I am working closely and in tandem with the Secretary General and the Treasurer of the Society. The tasks ahead are large and complex, so we need to carry them out together. All of our decisions are the result of our deliberations and agreements. Our main concern is to strengthen the rigour, seriousness and quality of all our activities. The ISLSSL is an entity of the highest international level and hence, our products must meet the highest academic standard. In this Bulletin there are a few ideas aimed at meeting these objectives and we will constantly work for their achievement ⃛ all our actions and projects are aligned with them. This fortifies our strong conviction that if an institution like ours does not evolve and progress, it will inevitably become irrelevant. As I have said on previous occasions, I am looking forward to your reactions and suggestions. We are committed to listen, learn and implement your ideas with a view to achieving the Society’s promise and potential. To all of you, my warmest regards and best wishes for personal and professional success together in the new year. Posted on January 17, 2013 .